Fresh v dry bay leaves: what's the difference? Travel the back roads of the goldfields and sometimes you'll see a few old European trees standing by themselves in the middle of paddocks. Usually, there's a plum tree, a quince tree and a bay tree, gnarled and overgrown. These would have been part of the kitchen garden of the house, now long gone. Fresh bay was used extensively in the kitchen. Fresh leaves were left in the pantry to deter weevils and moths. Meat dishes, such as long-cooked stews of mutton necks or shanks, were flavoured with the leaves, which added a pronounced clove-like aroma. Fresh leaves, if overused, can be overpowering in a dish and might need to be removed early during cooking. Once dried, a lot of this vibrancy is lost. Dried bay leaves impart a more subtle flavour and are generally left in a dish as it cooks then retrieved before serving. 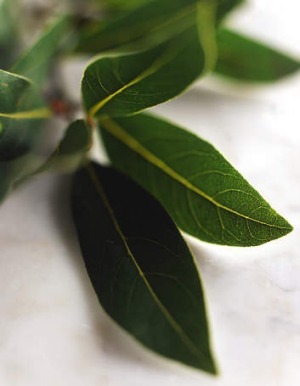 There is no substitute for fresh dried bay leaves because they lose their aroma with time. You can find meat syringes on the internet. Be careful when searching for ''meat syringe'' online because it might lead to unexpected websites. For recipes, try Michael Ruhlman and Brian Polcyn's excellent book Charcuterie: The Craft of Salting, Smoking and Curing, published by Norton Books. Boil 450 grams of salt, three cloves of minced garlic, 20 grams of pickling spice, 25 grams of sodium nitrite and 100 grams of sugar in four litres of water until the salt and sugar are dissolved. Chill the brining liquid, then soak a 2.25-kilogram piece of brisket in it for five days. Rinse the brisket, cover it with fresh water and 20 grams more pickling spice, then simmer it for three hours or until tender. You can inject the brine deep into the meat when you first soak it. Although some of the best meat in the country is sold in vacuum-packed, heavy-duty plastic, such as the brilliant meat sold at farmers' markets, the difference is they pack the meat shortly before sale. Some butchers, sometimes wholesale butchers, wet-age meat in plastic bags. It makes meat very tender. But when meat is stored like this, the pressure of the vacuum draws liquid from the meat and this sits around the flesh and leaves the meat with an off-livery taste. While it is perfectly safe, the tragedy is that many people have grown up with this and think it's the norm. If you come across this type of meat, wash the meat well in running water. Leave a question for Richard Cornish via the comments on this page, or contact him at brainfood@richardcornish.com.au or on Twitter @Foodcornish.